Sometimes all it takes is a little creativity and a willingness to think outside the box to find a new niche in an otherwise crowded industry. If you would like to start a small one or two-man logging business, consider this approach. There are millions of board feet of good timber that is passed by every day by the big sawmills and logging companies. It is a tremendous opportunity for you as a small logging company. You can go into a small woodlot and harvest timber because you don't have all the overhead that the big guys do. With a portable sawmill and a team of horses, you can carve out your niche. Here is what you need to do. Advertise yourself as an eco-friendly logging company. 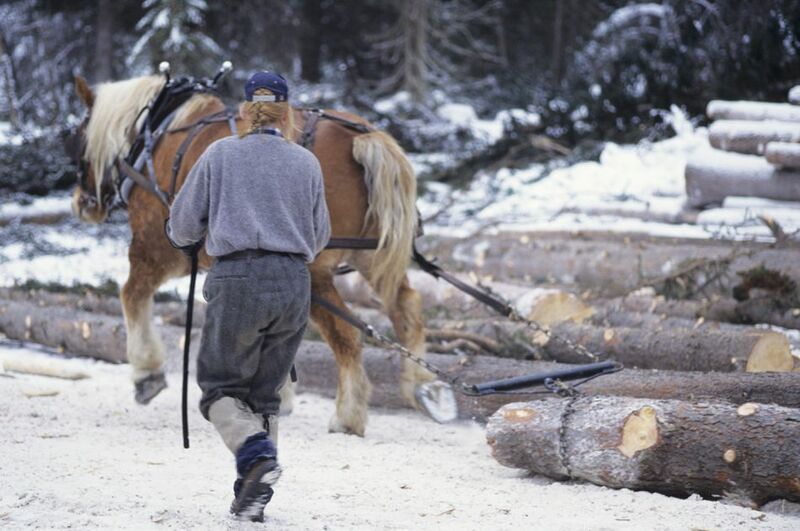 Let people know that you log with horses which are a low environmental impact way of logging. Tell them that you will go into their forest and cut a few select trees. Then you will skid them out with your team of horses, doing as little damage as possible. Once the logs are on the landing, you will set up your small portable sawmill and cut the logs into lumber right on site. You can inform the landowner that this is a better way of doing things because you are saving fuel by only hauling away the material that is used. All the bark, slab-wood, and sawdust can be left to decompose right there in the woods. Anytime organic material goes back into the soil it is beneficial to the whole ecosystem. As a side benefit, you will have reduced the chance of spreading harmful insects like the Emerald Ash Borer. The Ash Borer resides in the outer layers of the Ash tree just under the bark. All of that will be in your waste pile left on site. You could also promote your business as a forest management service. You can offer to go in and cut out dead and diseased trees, to promote a healthier forest. You can cut Elms that have been stricken with dutch elms disease or oaks that have been decimated by oak wilt, and even the aforementioned Ash trees that have been killed off by the Emerald Ash Borer. Don't be surprised if land owners let you harvest these trees for free or even pay you to take them off their property! You can then turn around and market these forest products as a green alternative product. The general population is concerned for the environment of our planet. People will pay more for lumber that is Eco-friendly because they understand that it takes more time and energy to harvest trees in this manner. It will be worth while for your customers to have a product that they can feel good about. You can be sure that they will tell their friends about you.